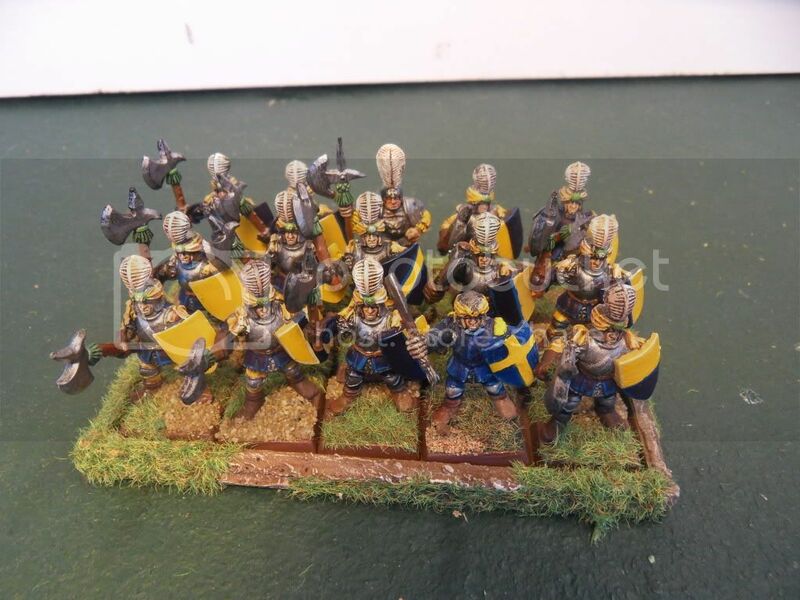 [WFB] Muncher Marc's Empire Nordland Army, 7000 points all done. I finally finished painting my Empire Army (well most of it is now painted, there are always a few models hiding somewhere). 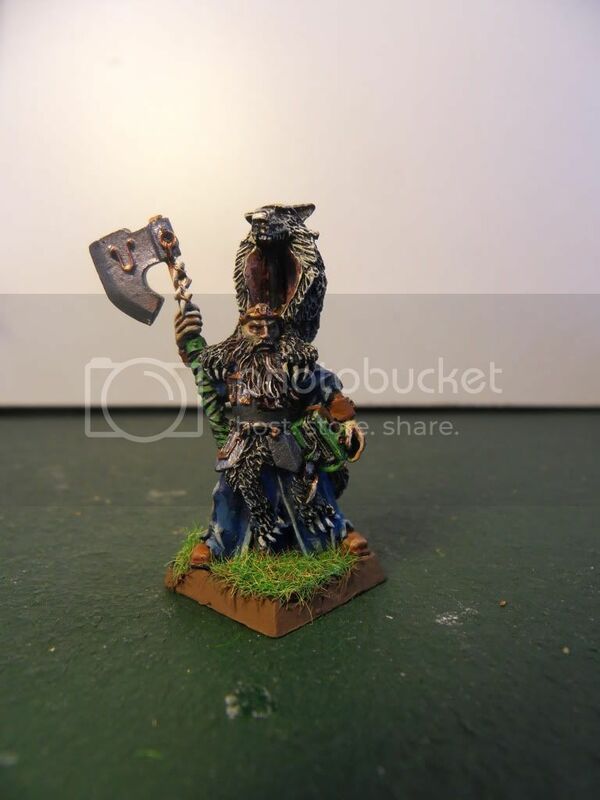 It stands are nearly 7000pts with all the wizards. There is still some highlighting and tidying up on some of the characters. That can wait for another day. Some units are of a higher std then others but this generally reflects a rush before a tournie and never getting back to do the highlights. The main target has been reached and that is to have my regular troops all painted to a good std. 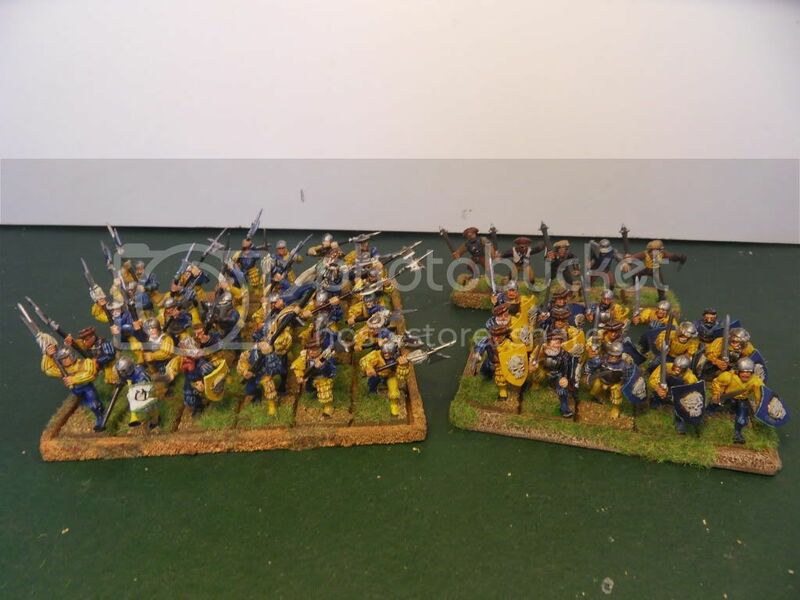 The army is schemed Nordland yellow and blue. And is named after the Capatus, Muncher Marc. 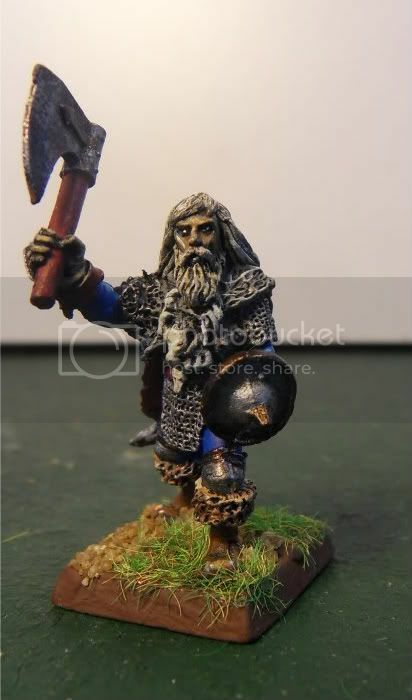 He was often seen with his halberd causing havoc when I first modelled him. I have been playing Empire since I started Warhammer and some of these models were in my first purchase. I selected blue and yellow before I realised that Nordland had those colours but I have to say I’m happy with the fluff. 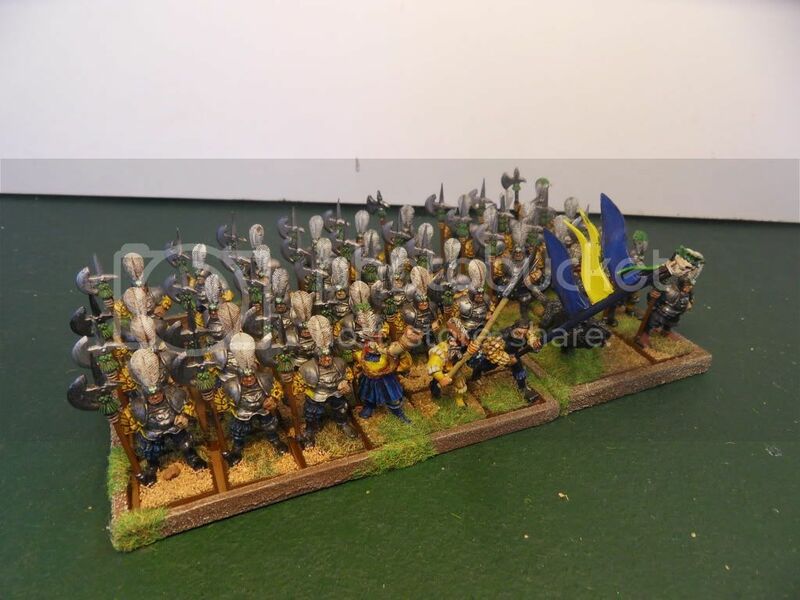 The way I have modelled up the army, all the regiments come with their own supports. You will see the parent with a 5 man free company and 15 man sword detachment. They are also supported by a shooting unit and have a hero to lead them. There are four such units. The flaggies run by themselves. Heros are listed above with their units but are also listed here separately. 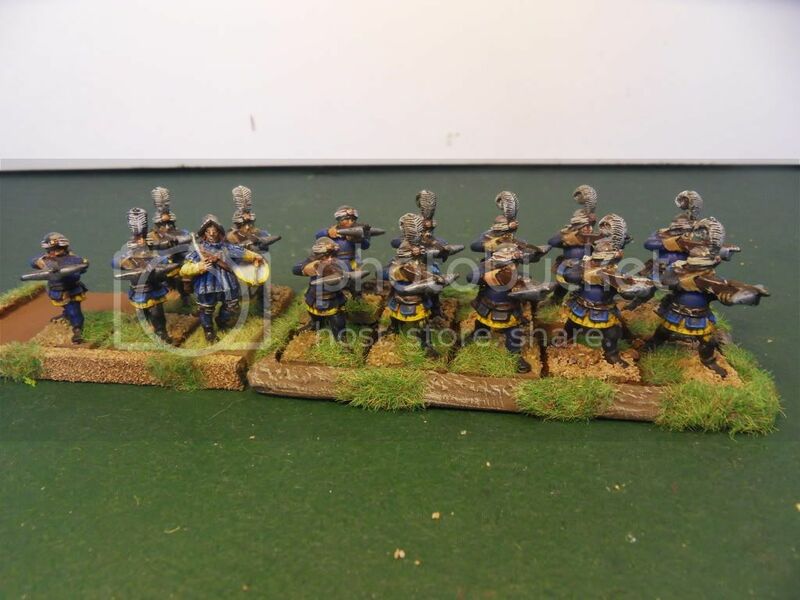 Here is the most recent regiment I have added. The Grimblades (yes I have read the book). This regiment has white tassels and ribbons. Note the unit champ is armed like the detachment. These are my most recent purchase second hand at BIG March this year. A lot of the blades were broken so I added the white tassels to support them. They are 34 strong. These guys are all swordmen, the shields have had the crown cut off and I have green stuffed on a skull. Still not sure about the feathers, I’m not big on feathers. I’ve taken some off, the rest my go one day. 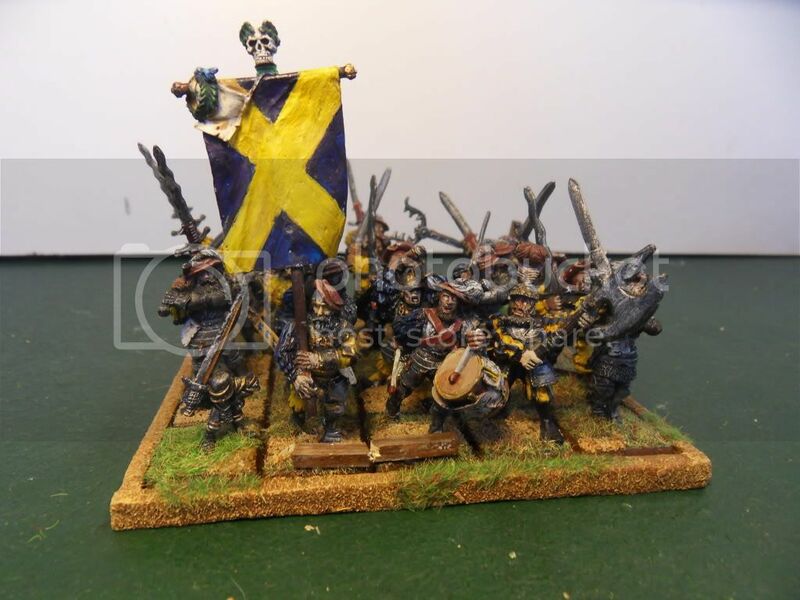 Here is the WP that goes with the white halberds. I’ll get some more photos up later this week. Wow - that's a massive achievement! Well done! On the Work Bench: Always Quar! !, Now - Napoleonic french!! Really looks toe goods when assembled on masse with a strong uified colour scheme. Makes me want to dust off my empire army. got any close ups of the war-wagon? Congratulations. That is an epic effort of painting. Thanks for sharing it. You are motivating me to go do some painting right now. Ranked 345th in Australia for Warhammer! Yeah BABEH! 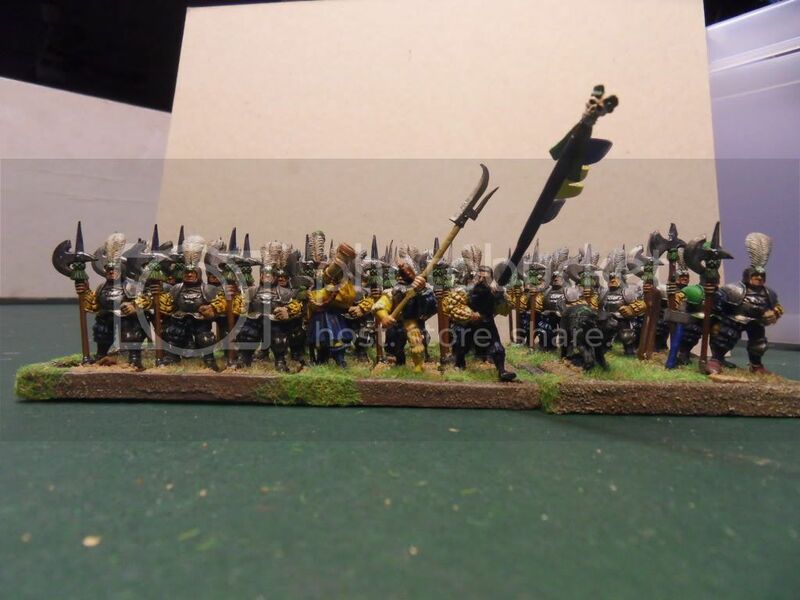 Next up are the green halberds, 39 strong. They only saw use as 3*3 detachments in the previous rules. They have a filler in the front row to boost the numbers. When I set them up for the photo I couldn’t find their base, I think it had been borrowed. So they are only 9 wide. 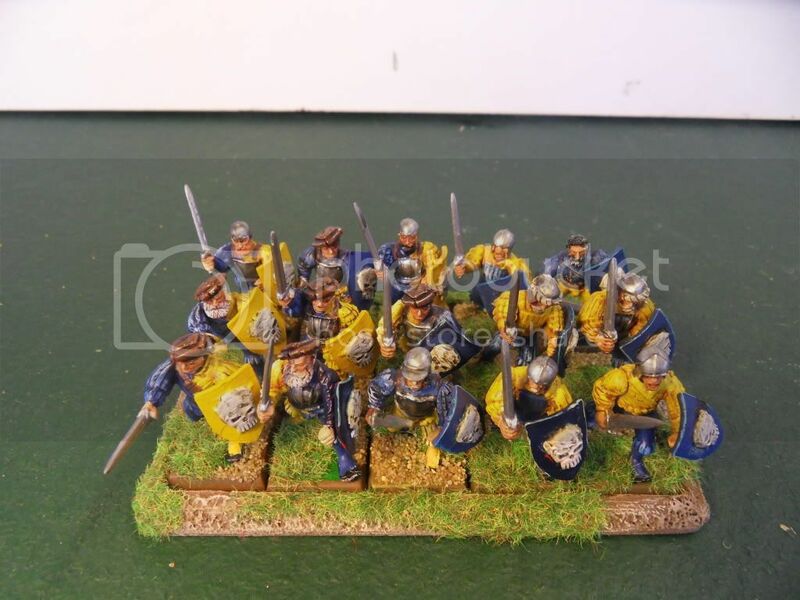 This detachment has all been converted from old halberds, some weapons swops and some have had the shaft shortened and the arm and axe realigned, so that they are not too uniformed. The FC detachment. I’ve tried to group similarly armed FC together so you can identify which parent they are from. I need to give this some more thought. The shooting support unit is the handgunners with caps, (no feathers). 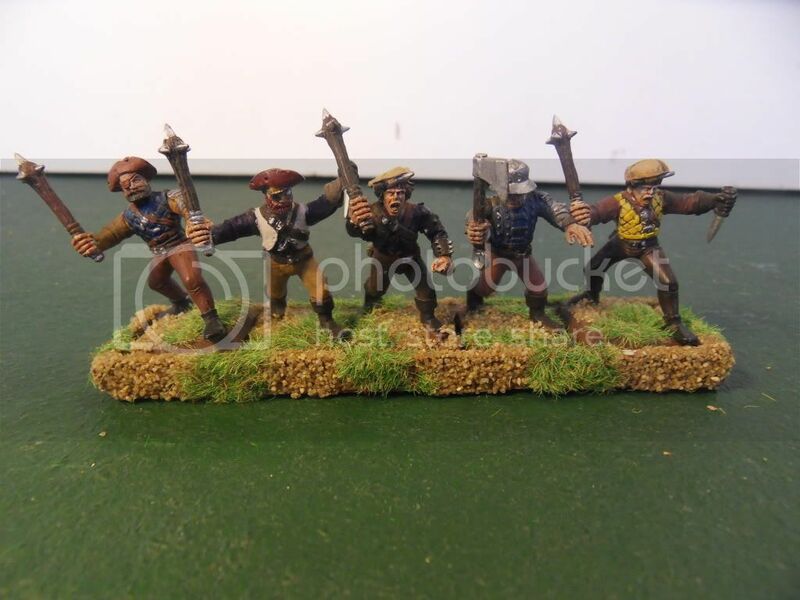 They come with a muso and hochland long rifle. The attached WP is colour co-ordinated with his unit having green binding and book. 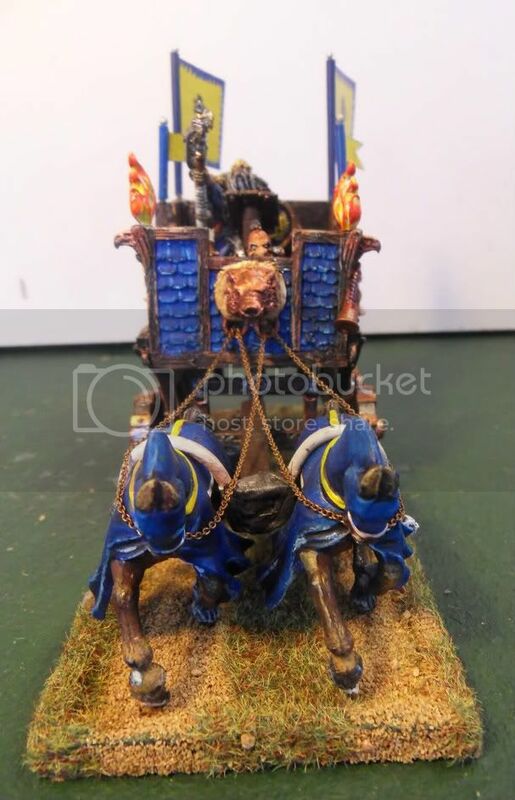 It took ages to win him and the mounted WP of Ulric, but worth the wait. 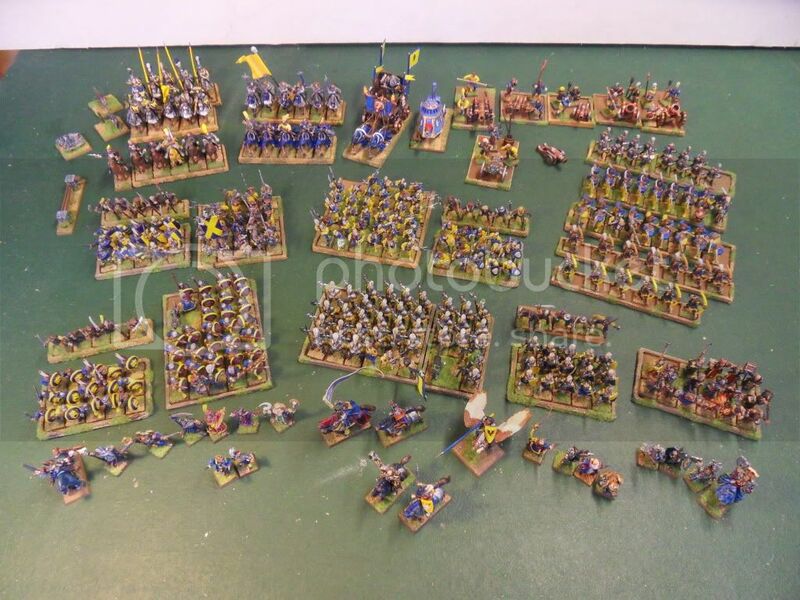 Mate, the dedication it takes to paint an army of that size is nothing short of amazing... you should be very proud. Just for you Jimbo, I have the War Alter pics. 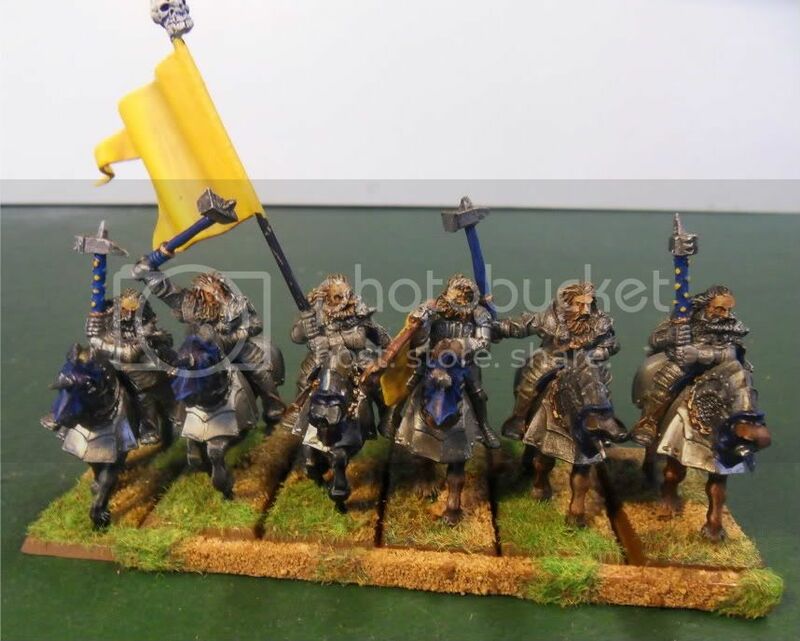 I have posted these before in an old Walter link but here they are again with Ul-Ulric. 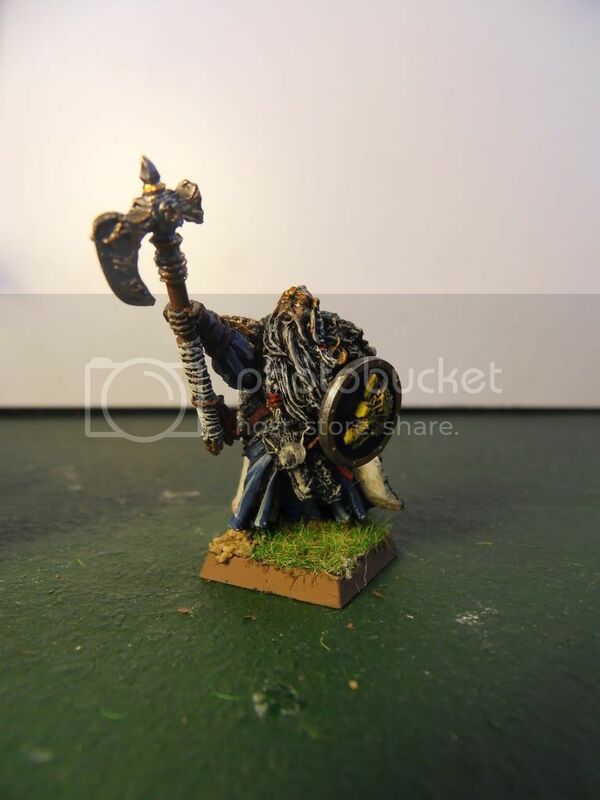 First up Ul-Ulric, I have given him a shield for WSSIWYG and I lost the icons coming from his back. 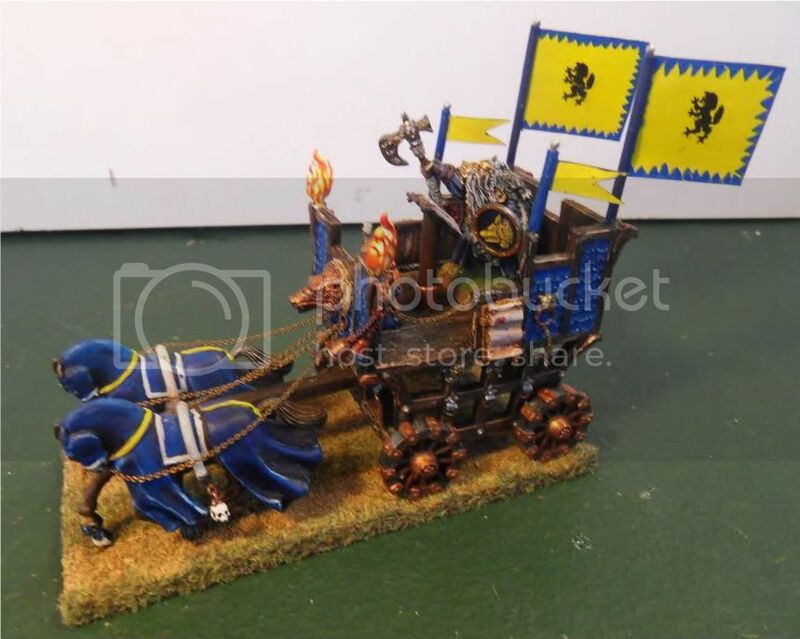 This Walter is based on the old war wagon, kindly donated to me by a Dark Elf player. Thanks Clinton. I cut up the walls to give it a more chariot feel and added a lectern to pray from. The wolf head at the back just finishes it off. Note the wolf head above the horses. Here you can see my Walter crew. I added him because I just couldn�t come to terms with Walter running around without a driver when Ul-Ulric died. 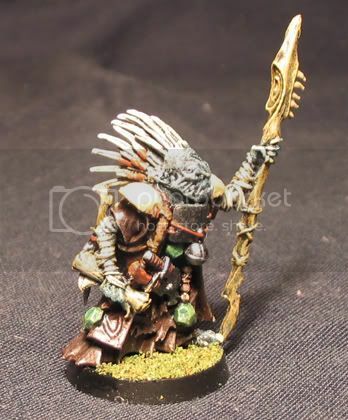 He is an old metal goblin but come up well as crew. The chains for the horses go through whole in the front of the wagon (see above) and up to his hands. 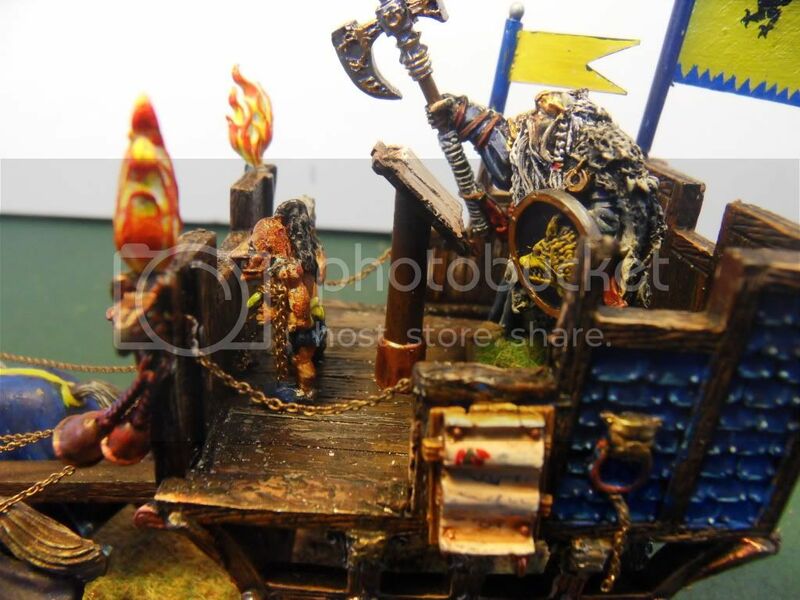 I also added side chains on the sides (WH&S) and some scrolls and things from the flaggie spew. 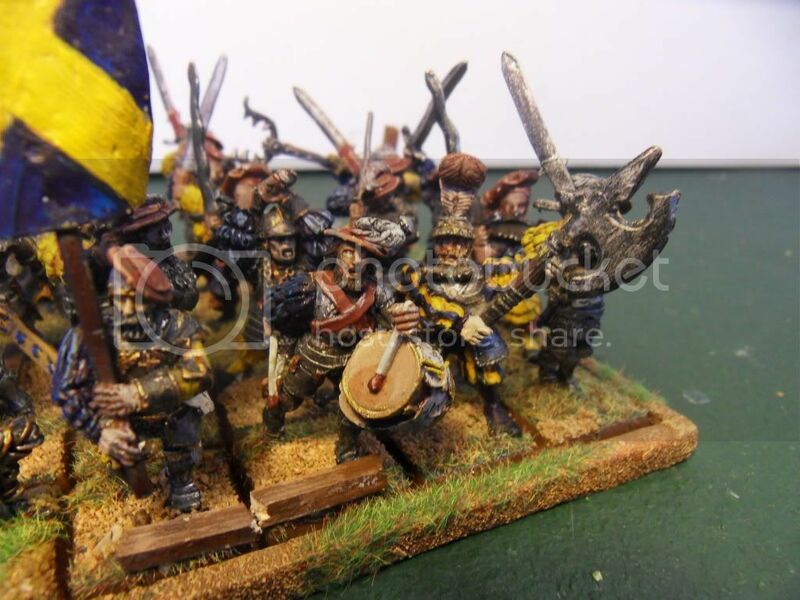 More to come include the spears and great swords regiments, artillery, mounted, heros, wizards and Lords. Here are the great swords. They are a mix of the old guys and the current metals. I have removed the feather from the old guys, improved them no end. 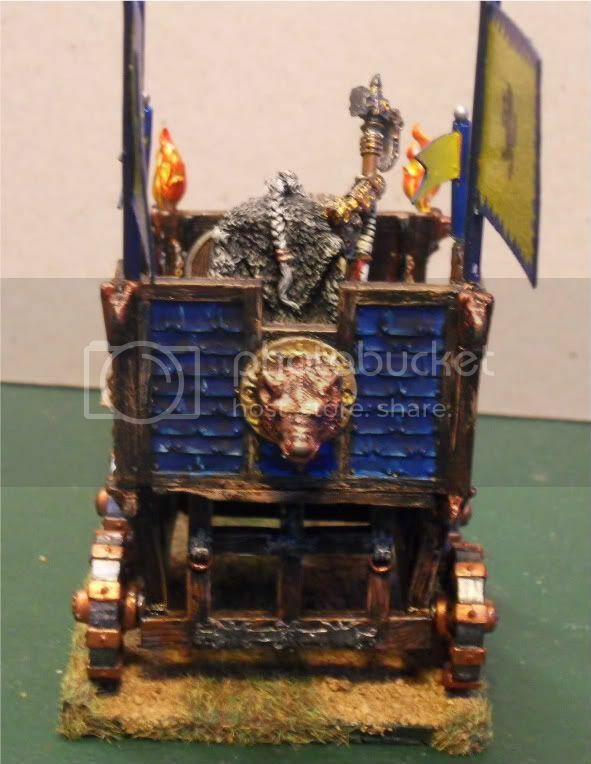 There are a couple of other odd models, including the unit champ who is from the war wagon. I have added a halberd blade to his shaft. 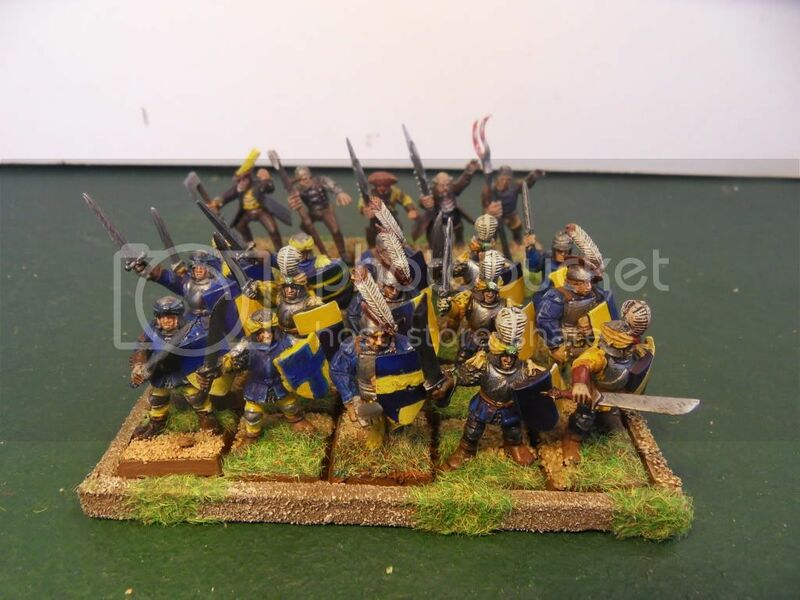 This detachment is a real mix, some old halberds, spearmen and the odd swordsman. The old halberds have weapon swaps, some of them still have their big bulbous feathers. 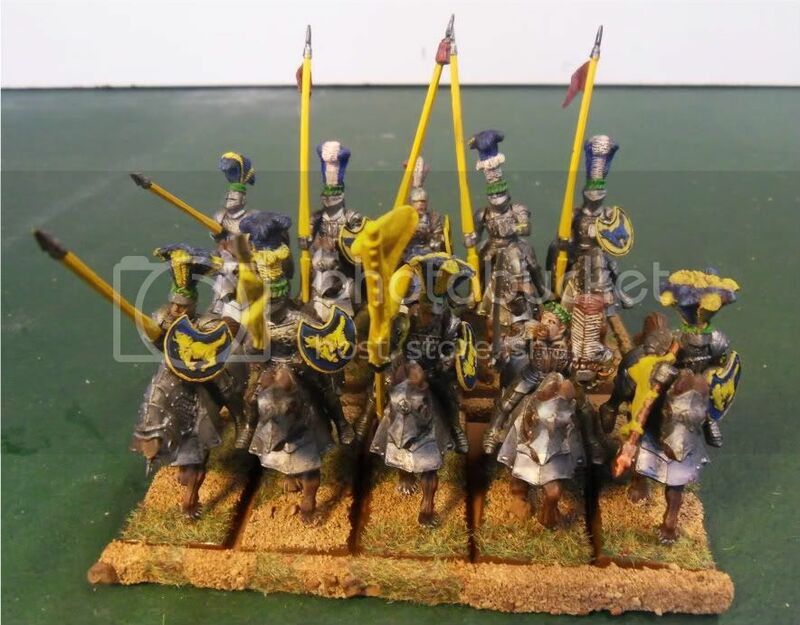 The spearman are all the guys which had the spear going straight up so I have given them a new sword carrying hand. So they all end up with swords and triangular shields. 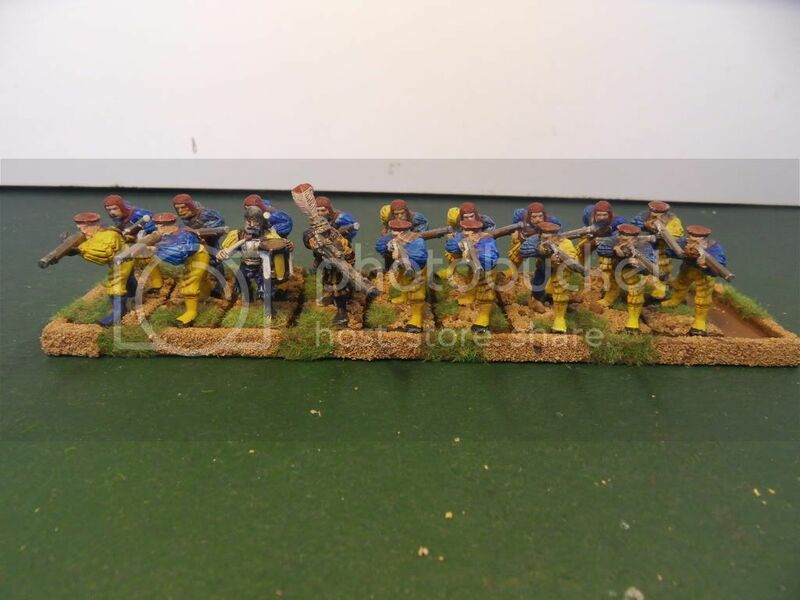 The FC detachment have halberds. Life has got in the way but here is the next batch. 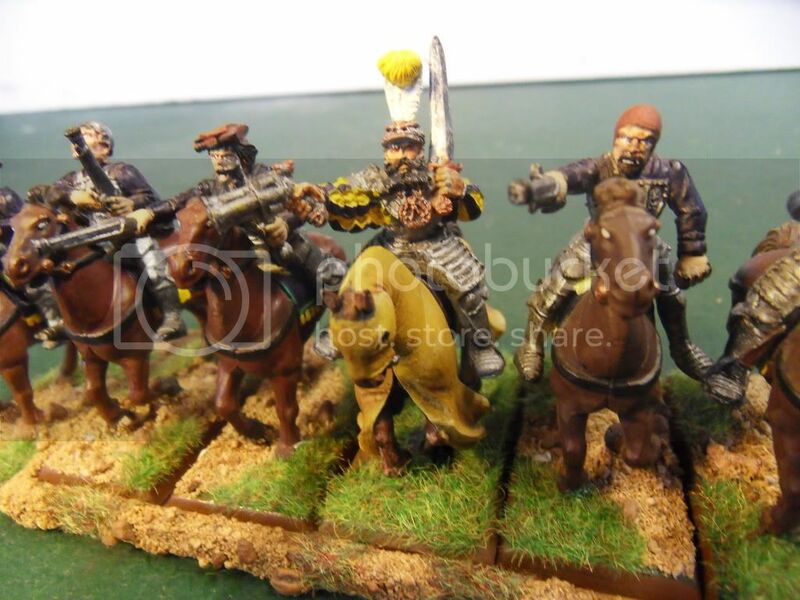 Next up are the cavalry. The pistoleers include an old outrider as a unit champ. 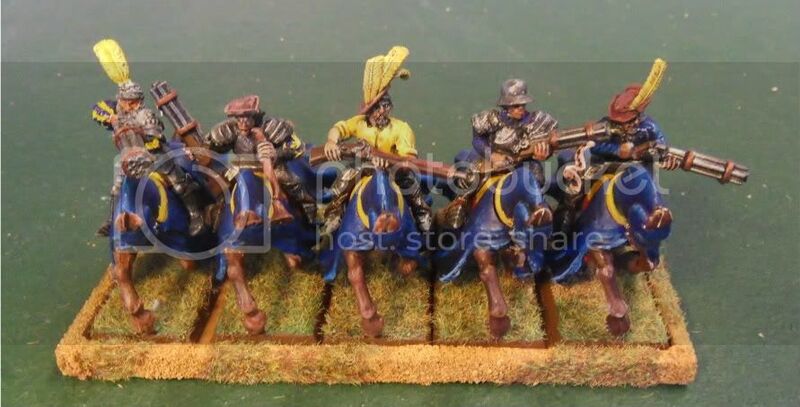 These guys remain a staple for most armies and are arguably the best fast cavalry in the game. 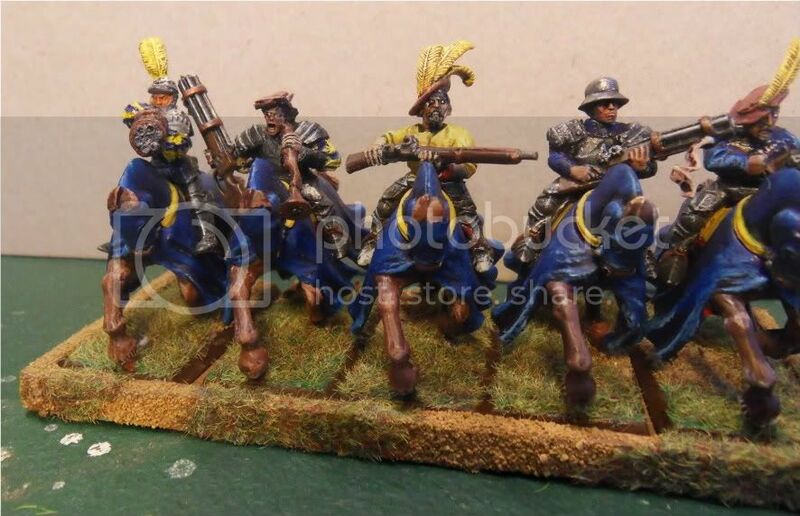 Next the outriders, who are mostly converted knights. They were the very old models with a moulded shield and lances. Note the armoured shoulders and legs are really all that�s left. I had to carve out the shields. The hochland is a thunder buster from the free company spu with a metal rod and some green stuff. The musician has the end of the thunder buster as the flute of his horn. There is also an old outrider here on the left as well. I really enjoyed making these guys. 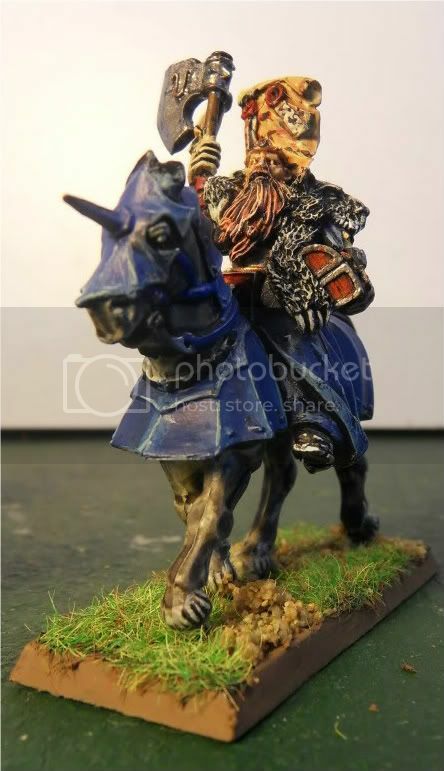 It was one on my earlier conversions, this also helps give the units different looks. 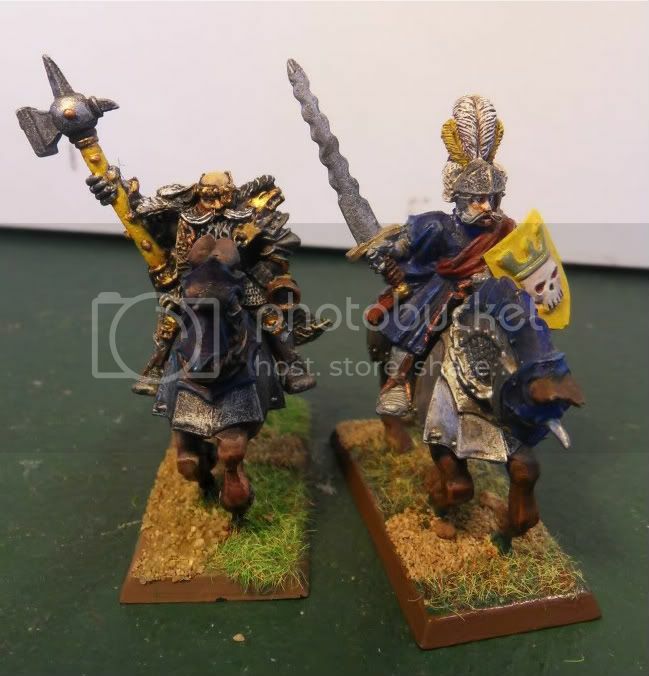 These guys are your std empire knight with lance. In the latest touch up they got some colour. I think I could add some more? 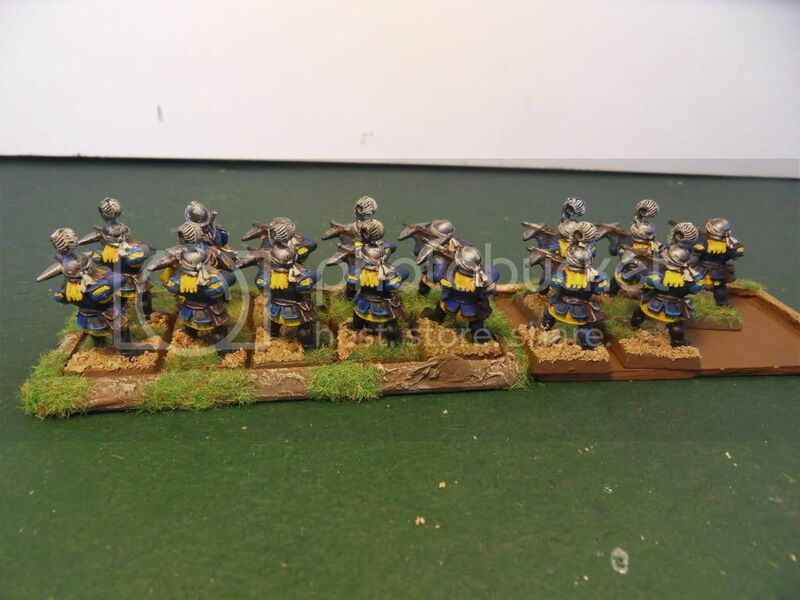 They are painted so they can be two vanilla units. One with yellow and blue feathers the other with white and blue. The std can be replaced with a lance. I think the shields have gobo origins. I have run them with the round lion shields used by spearmen. I can add a couple of lords and warrior priest. 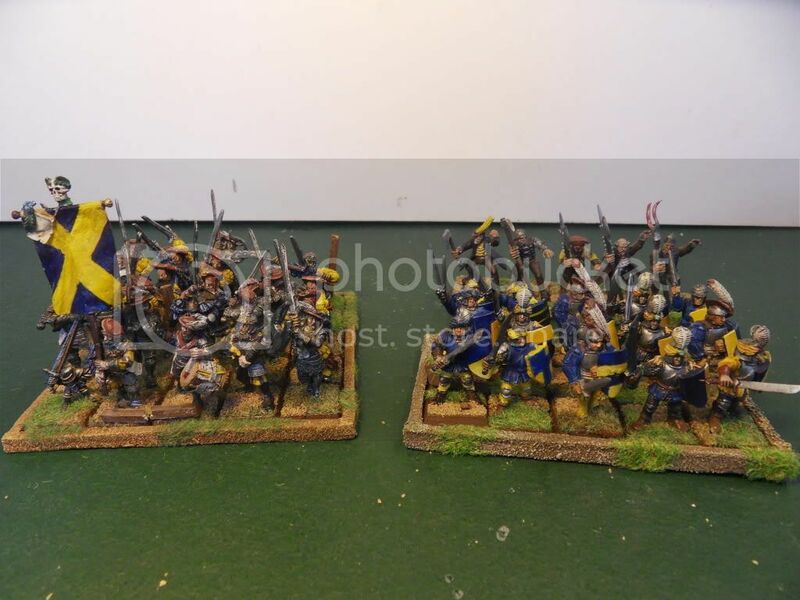 what a relief - a painted empire army! Nice work, plenty of very old school figures in there. 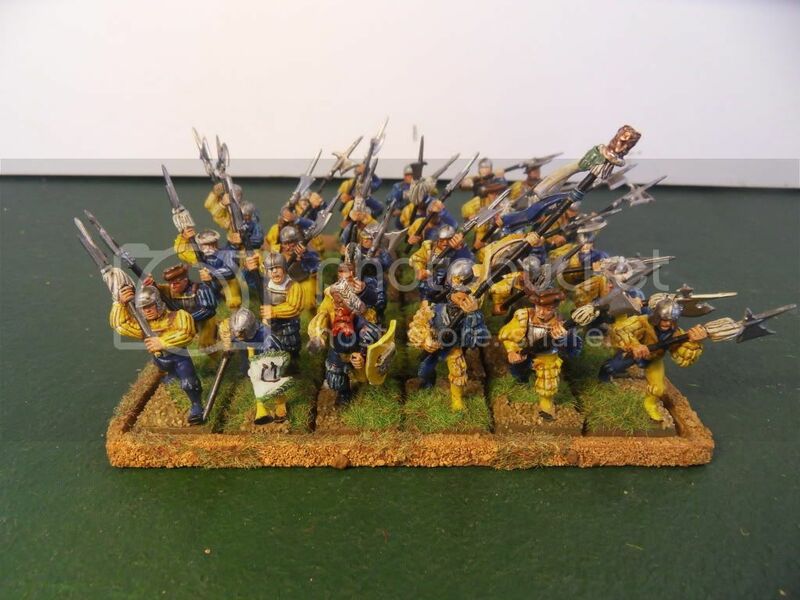 If I'm not mistaken the crossbowmen are from Battlemasters. Yes I believe they are. they were part of the first lot I got on ebay. many years ago. 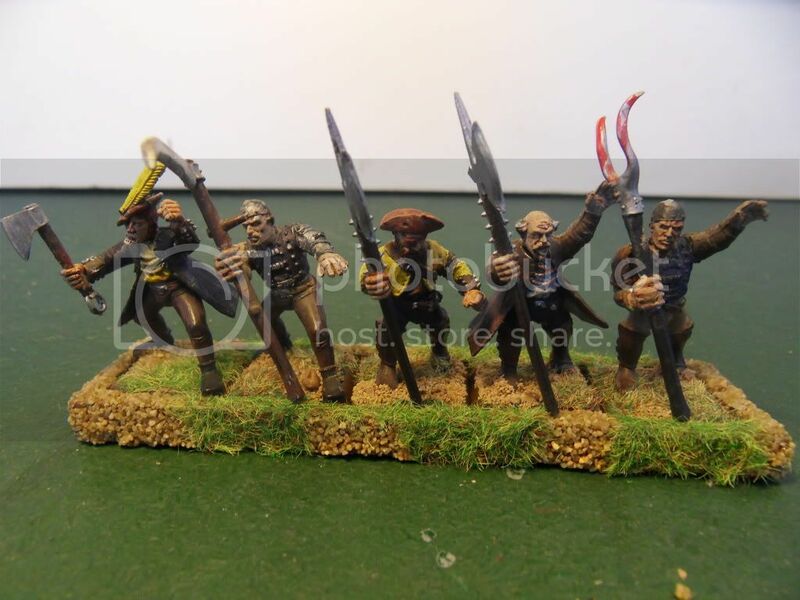 Nice work, army looks great en masse - very inspiring to the budding Empire Captain. Q. Are the 5-man FC detachments much use? How do you use them and what sort of mileage do you get?